The "Tour" has been such fun to get photos from the places, fur folks and their people! Please add your story or adventure in taking photos, the book, etc. on this blog to share with others who are joining the traveling birthday party. When you get the book...pass it on to another with speed so it can travel fast to find new friends! 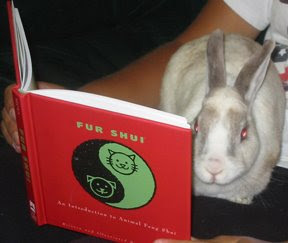 Here's Dolce the bunny from San Diego absorbing some points of interest from the book...hmmm, wonder if she is in the partnership section or the children life section!